This is John Fale’s fish shop in East Street. 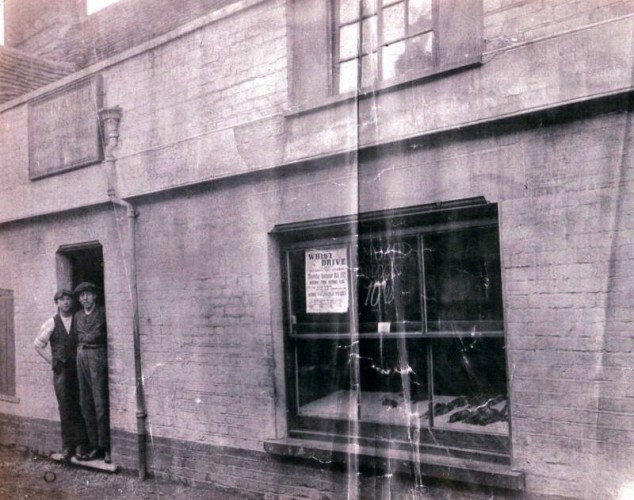 Standing in the doorway is Alec Green, father of Ken and Peter Green of the fish retail trade, and standing next to Alec is Edwin Green soon to become the owner of Green’s fish and chip shop in East Street. Edwin was 16 years old when this photo was taken. Sally Mc Andrew asked: Is this building still there? No sorry all those lovely old buildings on the left hand side of East Street were pulled down in 1930s. I think they were built in the 18th century. They were replaced by a fish and chip shop run by Brian Green for many years. Question: Is that Edwin as in Edwin Joseph Green? (1894-1965). He married my grandma’s aunt – Elsie Jane Kemble (1895-1928). They had three children, and their only son, Jack E Green (I don’t know his middle name but presumably it’s Edwin), was born in 1921 and was killed during WW2. He’s one of the few names on the WW2 side of the Wivenhoe war memorial and he’s buried in the New Cemetery with an RAF stone. If that is Edwin, it’s great to see a photo of him! (If you like, I can send you the photo of Elsie on the beach with her three children, with my grandma and her brothers, some time in the mid-late 1920s) Helen Barrell. Yes that is Edwin Joseph Green, i think he re married Lilly Payne, one of his son’s is Barry Green, who is still alive and well.